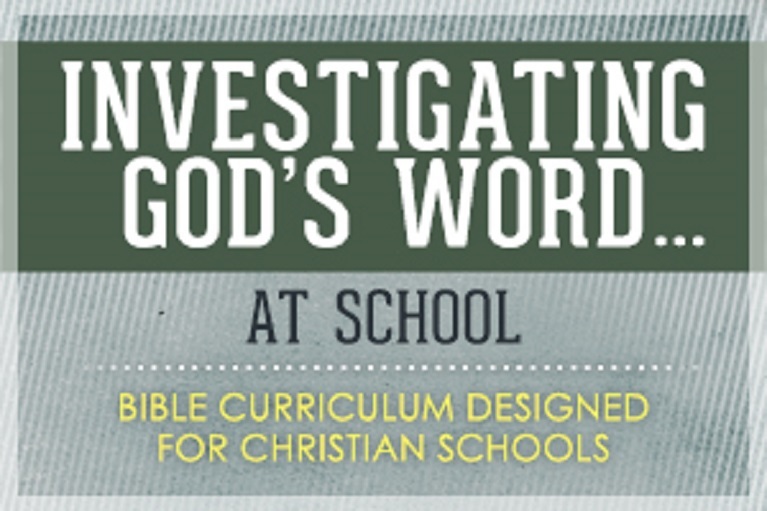 Investigating God’s Word...At School is a Bible curriculum designed for Christian schools, grades 1st-5th. Each unit provides material for four lessons a week for nine weeks. The recommended teaching block is 30-40 minutes. This Bible curriculum also includes Scripture memory. (1) It teaches the entirety of God’s Word, from Genesis to Revelation, over the course of five years. (2) It teaches the students how to study God’s Word for themselves. (3) It includes daily quizzes in order to help the students build their Bible knowledge. (4) It teaches the students a Word of the Week each lesson to build their vocabularies. (5) Each lesson puts the texts of Scripture in historical context, teaching the children that the Bible is real history. (6) It trains the students to apply God’s Word to their lives. (7) It systematically inculcates a Biblical worldview, training children to think Biblically. (8) It gives the students tools to defend their faith in Christ. Introduction. Each “Day One” starts with an introduction to the lesson. Younger children will be asked a question to provoke their thinking. Older children will be taught a Psalm or Proverb of the day to “call” them to study. Quiz Time. Next, the students are quizzed in order to train them to remember what they have learned. These quizzes will often cover what they learned the day before, but sometimes will cover material elsewhere in God’s Word that they should already know. Major knowledge areas like the Ten Commandments, days of Creation, etc., may be quizzed more often. W.O.W! The W.OW! is the Word of the Week. Each lesson will introduce the students to a vital Biblical vocabulary word. These words are either found in the Scripture text itself, or they are important theological words that the children need to learn. The W.O.W! often provides the theme for the entire lesson. Historical Context. Each lesson, the Scripture text is placed in historical context by use of a timeline. It is essential that the children learn how the story of redemptive history fits together. Bible stories must not be viewed as detached scenes—they are to be shown as a part of a much bigger picture. The timeline is a useful tool toward that end. Bible Investigation. The Bible Investigation time is the heart and soul of each day’s lesson. It plunges the student directly into God’s Word, not simply a paraphrase of a Bible story. All Scripture text included in the curriculum is from the English Standard Version (ESV). The Bible reading is taken in short sections, separated by times of discussion, questions, and application points. This format allows ample opportunities to stop, think about and discuss what is being read. Scripture Memory. At the end of each Day One of the two-day lesson, the students will be taught a Scripture memory verse. These memory texts will be connected to what was studied that day. And, since you will cover two lessons each week, the students will be memorizing two passages a week—twice as much as most memory programs. Day Two components include a couple of Day One components, and add two very exciting sections to the study. Quiz Time. Day Two begins with a quiz. These quizzes are most often an intensive review of Day One material. Again, it is recommended that your children write out the answers to the quiz and keep them in a Bible study journal. Historical Context. As you prepare to read the Scripture, you will again have the opportunity to put it in historical context for the student. The timeline will visually demonstrate where you are in God’s Word. Bible Investigation. Again, this is the heart and soul of each day’s Bible time. Your students will learn how to study God’s Word for themselves, as they read, answer questions, discuss, and apply the Bible to their lives. Worldview Builder. This component is found only in Day Two of each lesson. It has been created because of the need for our children to develop Christian worldviews. Developing a Christian worldview is the task of learning to look at everything in life through the lens of Scripture. It is being trained by the Holy Spirit and the Bible to think Biblically for the glory of God. The Worldview Builder section helps the students to connect what they are studying to a “pillar” of a Christian worldview. The four main pillars that are used in this study are: Creation, Providence, Rationality, and the Fear of God. After putting the particular pillar on the board, the students will be asked to list things about that truth that they learned in the lesson. Defend the Faith. A necessary component of a Bible curriculum is training our children how to defend the Christian faith. It is not good enough to give them Bible knowledge—they must learn how to answer questions about what they believe and why they believe it. To that end, this section will present the students with a questions that they will have to answer. You will also teach them the right answer after they have a chance to share their thoughts. This will begin the training of answering the skeptics and their attacks on Christianity. Scripture Memory. The day’s lesson ends with a review of the Scripture memory passage. You may use any method to help the students put it to memory.